Fully Tailored Car Mats for your Multi Grip Tyre Socks for17 inch Wheel. Guaranteed fit! Snow Approved Fixings. Manufacturers Warranty. Pair of Multi Grip Snow SocksThe Multi Grip Snow Sock is designed to be used on snow and ice, and is a great alternative to snow chains. Made from a synthetic waterproof fabric, the Multi Grip gives a consequent increase in the coefficient of friction between wheel and snow or ice surfaces. 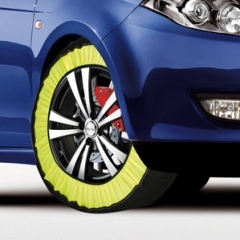 As a result the Multi Grip is effective on snow and ice ….